We are so happy that we decided to choose Wedding Wish to do our decorations and flowers. The team was always friendly and the communication went smoothly. Everything looked stunning and even more beautiful than we have ever imagined. Everything was just perfect and breathtaking. All of our guests and for sure we also were so amazed. Wedding Wish team is extremely professional and hard working. They put so much dedication in to our wedding. Without any more words, they had done a perfect job and we are so grateful for everything. The flowers looked so surreal, most of our guests had to touch them realise they were real! Although we had to communicate everything via emails and phone calls, they still magically made it all perfect. We loved the set up and the colour combination. We had definitely selected the best florist for our wedding and we can never thank them enough. From start to finish, the wedding wish team were amazing! Nothing was too much trouble and they created the most incredible wedding for us. Their ideas and designs ar beautiful and the customer service is second to none. All of our questions were answered quickly and thoroughly. We can’t thank the whole team enough for being part of our special and amazing wedding! I can go on because what you gave me and my wife are the greatest memories of our special day that we could of asked for. True professionals, caring, loving, punctual just beautiful people to ever have themed our wedding. My fiancé and I planned our elopement in Santorini, Greece, which was a little daunting considering we're from the United States and had never visited the island before. Wedding Wish made us feel like a priority and gave us plenty of help in choosing our design vibe. The day of our wedding, the team that delivered and setup the flowers were so incredibly sweet. Everything was so perfect, it brought me to happy tears. 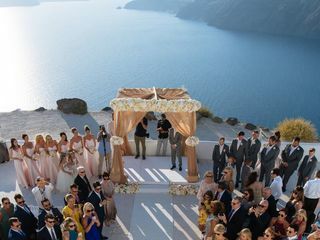 Definitely would recommend Wedding Wish to anyone planning their special day in Santorini! Metaxia was amazing with the decorations and was very flexible with our ceremony. We had a Persian and then Korean ceremony and each were beautiful thanks to her. We highly recommend Wedding Wish to anyone who will need floral decorations for their event in Santorini! I am truly beyond words trying to explain my experience with Wedding Wish! Metaxia really exceeded my expectation with how beautiful she made my experience. She pulled my wedding together and exceeded my vision in less than a month and all over long distance communication. We had a very small and intimate wedding and I was expecting a couple of bouquets of flowers and a few candles etc and what I got was something breathtaking. I'll let the pictures speak for themselves. Fantastic job Metaxia and thank you so very much for the sweet and thoughtful gift. That's all beyond the kindness, warmth and comfort that you gave me during the process. Thank you for it all! From the questionnaire, to the endless support and to the impeccable and incredible execution of the decorations at our wedding venue, the team has been incredibly understanding of our vision, our needs and delivered the absolute best flower decorations we could possibly dream of! The Wedding Wish team made our wedding day perfect, thanks to the beautiful details in every single aspect of their work. We are blessed and so grateful to every single one of them. 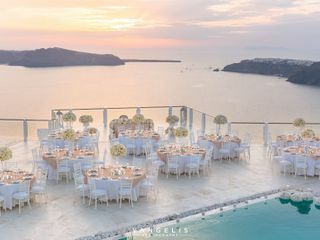 We highly recommend Wedding Wish to any couple getting married in Santorini and we enjoyed working with them- so lovely and professional. We will never forget our perfect day! Love love loved everything about our flowers and wedding decor. 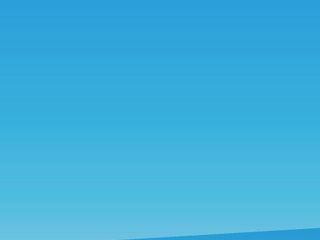 Really easy to chat to via email and they were more than happy to change some things and suggest ideas. Everything was absolutely beautiful and everyone has commented on how nice there were. Would definitely recommend. Wedding wish is definitely worth a full set of stars in all the categories for me and my husband. We were so happy with the professionalism combined with flexibility and warmth. Planning a overseas wedding, it's hard to feel that you have control. But when it came to the flowers I never worried. I can highly recommend them! We contact wedding wish about our wedding in Santorini and they could not have been more helpful and replied to emails very quickly. Our flowers, bouquets and wedding table decorations were so beautiful and we would highly recommend. Wedding Wish were great to work with!! We were referred by Poema Wedding Planners and I'm so glad we were! Wedding Wish excelled my expectations! My wedding bouquet was absolutely stunning as well as the venues! The great thing about this company is you tell them what you like, and they will make sure they make your choices exactly how you wan't it, or even better! My wedding wouldn't have been the same without the beautiful flower arrangements and the little details! Thank you so much for making it the most beautiful wedding we have ever seen! Wedding Wish were recommended to us by our wedding planner, Poema. They provided the flowers and decorations for our wedding, and did not disappoint! In the beginning we provided Wedding Wish with our desired flower and decoration choice, along with our budget. Wedding Wish took this on board and created the most beautiful arrangements. We asked for orchids and orchids is what we got. 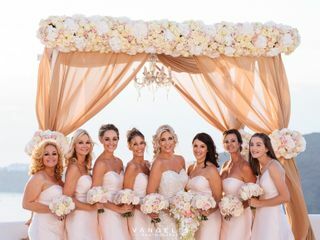 On our wedding day the bouquets were both stunning and so elegant, and the decorations at both the ceremony and reception venues were exquisite. Our guests were blown away by their beauty and class.
? ????? ??? Wedding Wish ????? ??????????? ?, ????? ???? ???? ????????????? ? ??????? ? ???? ??? ??????. Wedding Wish provided us with a professional and efficient service for our Wedding that took place in August 2016 at Santorini Gem. Wedding Wish took on board our design ideas for our day and delivered on this with cosniderable flair and creativity. The floral centrepieces and associated decorations were exceptional and transformed our wedding space into a wonderful venue in which we along with our loved ones could celebrate. We totally recommend their service. Simply wonderful! 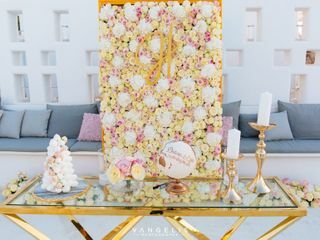 I used Wedding Wish for our flowers and venue decoration at the Santorini Gem and they did not disappoint! My bridal bouquet and my bridesmaids bouquets were absolutely amazing (my flowers of choice were white orchids) and more beautiful than I ever imagined them to be. I imagined the bridesmaid bouquets to be quite a lot smaller than my bridal bouquet but they weren't and were nearly the same size. The grooms and grooms men's button holes were also beautiful. The decoration was perfection and I could not fault 1 single thing. If perfection is what you are looking for then Wedding Wish will fulfill this. Thank you so much. I had my wedding on August 15th, 2016. The island itself is amazing with great places to do your ceremony but it is even greater if you have someone professional to help you out. We didn't know that at 15th of August they are having a huge feast and the island was about to sank, it was overcrowded but we had this EXCELLENT STAFF by our side. The people from the WEDDING WISH worked well with us and as a bride they really distressed me out. It 's not very easy for that special day to organise it through emails , when we have 12 hours time deference as I m staying in Melbourne. Although the staff was replying very quick, helped me by making suggestions and proposing decorations that I liked and all the above on our budget and found prices that fit .The decor that they suggested i loved it and we didn't need any extras. I just can't say enough about the attentive and nice team.Everything was exactly as they had promised. I chose the fully personalized wedding project (wsd), because I was very excited from the pictures I have seen in their Instagram & Facebook account. The outcome was definitely my style!!! From the fresh flowers of the bouquet, the candles, the golden napkin rings to the unnoticed details. The WEDDING WISH made the entire process easy and pleasant. I will definitely recommend them to my friends. Look no further, if you are very particular like me in how you want your wedding flowers and deco. After reading about wedding wish, I didn't have to think twice on who to choose for our flowers and venue decoration. Wedding wish fulfilled all our wishes and made our dream wedding a reality. We both were greatly touched by their thoughtfulness, individualised approach and personal touch! They set the most romantic and dreamy setting for our intimate caldera ceremony. 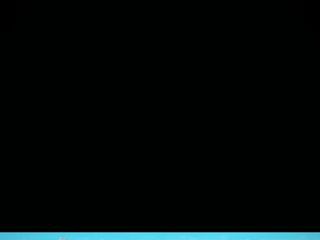 They were extremely professional and always quick to respond to my emails. I would highly recommend them to any one who is planning to have a dream wedding in Santorini. Thank you Vicky! You are the best! Thank you so much to everyone at Wedding Wish! We came all the way from America to have our ceremony in Santorini, and Wedding wish you delivered! You were so easy to work with and made our day unforgettable! I was amazed at how wonderful everything looked. It was the best experience walking up and seeing the venue decorated to perfection with everything I had dreamed of. I cannot thank you enough for all your hard work!